Hello, my name is Michaela Raeburn and this is the story of my New Life. It all began when I moved to Crete in May 2009, the kind of place I’d always dreamed of living in. The scenery on Crete is so beautiful and sometimes so breath-taking, that it is no wonder that it draws so many artists to the Island. I was getting so depressed with the poor light which comes from the lack of sunshine in the UK and frustrated with the rut I seemed to have fallen into – that a move to Crete and an opportunity to finally channel my creativity as a way of making my living – became irresistible! I have always loved to paint and draw and I enjoyed a wonderful career working with highly creative people in the Design/Marketing and Advertising Industry. When my 2 daughters were very young I was working part-time and so I undertook commissions and sold my paintings at Art & Crafts Fayres. Then I returned to full-time employment in a Graphic Design & Advertising company and there I remained for the next 13 years. Circumstances changed all that and I found myself working part time again. With the girls all grown up and doing well in their own chosen careers, I realised I had lots of ‘free time’ for the first time in too many years! I was in my 50th year and somehow just ‘knew’ my life was about to change. I’d always told family and friends that I was determined to leave the UK before I was 50! Suddenly I had time to paint and create and I was brimming with ideas! So I progressed these ideas to form my style of contemporary art. As far as I can glean from searching the internet, no-one else is doing anything like it. When my entrepreneurial boss was convinced I was onto something – I knew I had a winner! During the next year I started to develop the concept and at the same time realised that my market did not lie in the UK. Though I had sold some early pieces, during that experimental/learning stage, it was obvious I needed to be based in sunnier climes, full of tourists. The timing seemed perfect. My 2 girls have both been lucky to travel the world a bit, after uni – now it was time for my travel experience! I sold my home and packed myself off to Crete. The plan was to give myself 6 months in which to test out my unique 3D Art. Would people buy it? In a lovely little place called Almyrida I set up my “stall” and display and sat down at the edge of the beach, to work on my mosaics. I thought that if people could see and watch me working, they would know how much effort goes into them and see the natural materials (nature’s gifts) that go into the creation of them. They would know that they were buying a true souvenir, hand-made in Crete instead of mass-produced in Hong Kong! The marketing plan was in place. My seashell mosaics and collages are unique and I absolutely adore “Working with Nature”. I am thrilled to say that my unique style of contemporary art appears to be a success! The tourists and the locals love them and for the last 3 summers, I have barely been able to keep production up with demand. I don’t make lots of money, but happily I make enough to cover all my living expenses on Crete and have continued living happily here for almost 4 years. Not once have I regretted the move. I have a wonderful, stress-free, full and contented life. Love the blog and it will be great to hear what you are up to in between Skype calls! Life is short but you make the most of every single precious day! You are an inspiration to others to follow your dreams 🙂 We wish you many more years of success and happiness in Crete! What a fantastic blog! You are so positive and sunny in your posts – a reflection of beautiful Crete, surely. I love seeing the different pictures of your art in the various posts. 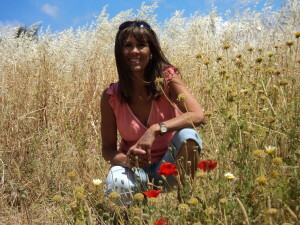 Thanks for an insider’s view of life in Crete! Thank you so much for your positive remarks! It is still early days but I will make sure to include more of my artworks. 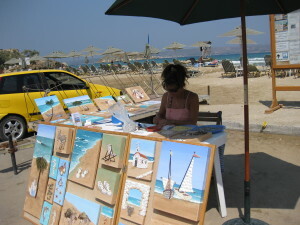 Today I bought a beautiful artwork from you, It will be the memory we´ll take home with us this year from Greece. Thanks for the many nice artworks you make and keep working with the nature, we do need to take more care of our planet. Hi Rickard, thank you for your comments. It was a real pleasure to meet you and your family and a very big surprise to learn that you had come across my blog even before you came to Crete! Wow!